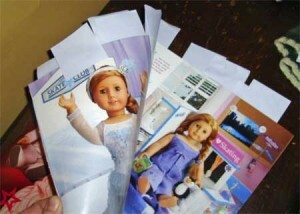 The American Girl Catalog with a multitude of sticky notes spewing out the top. 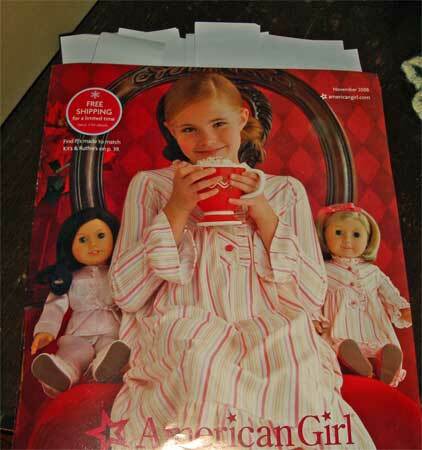 Exactly 15 minutes after this American Girl catalog arrived in our mail box today, it was tagged with sticky notes to demark “the pages that have things I like.” My 5-year-old ooh-ed and aaah-ed and I-want-this–ed all the the way through all 63 pages. That made me smile. My beading catalogs immediately become tasseled with sticky notes when they arrive in my mailbox. Finally, proof that my child (who looks like her dad) has some of my genetic material. Or just good training. Good luck, Santa! This is just the beginning of the sticky note frenzy.